I was teaching Storyline recently and one of my students wanted to put a check mark image into his project. Before I could blink, he was on Google, had searched for a check mark image, found a ton of them, downloaded the one he liked, and added it to his project. Done and done! Of course, the image was copyrighted (as are most images you'll find via Google searches). Given that he is a Storyline 360 subscriber, I showed him a better way to icon-glory that's not only cost-free but copyright-free and royalty-free. 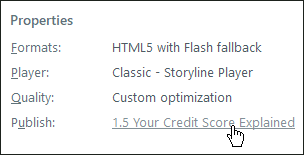 From the Storyline 360 ribbon, select the Insert tab. From the Content Library section, click Icons. In the Search Icons area, he typed check mark and pressed [enter]. The result was more check marks than he could possibly ever use. Better still, he was able to quickly change the color of the shape once it was loaded onto his slide (something he would have been unable to do with a checkmark image lifted from the Internet). Similarly, you can use the Search feature to find anything from puppies to kittens to boats. 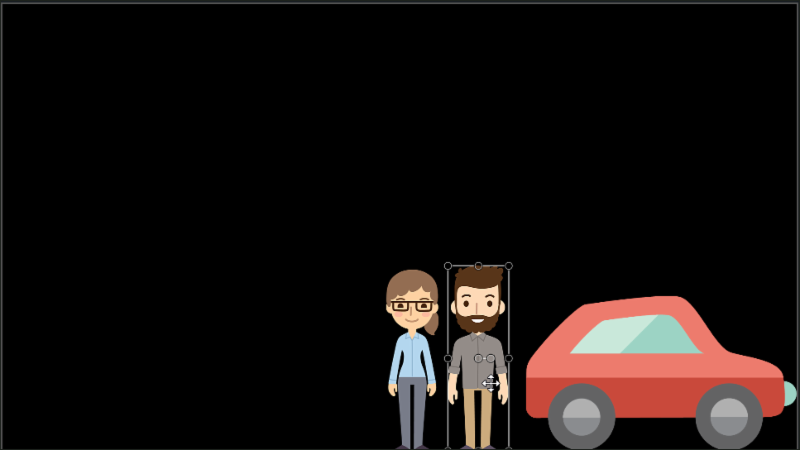 And again, everything you find is free to use and/or modify in your Storyline project. If you're looking to learn Articulate Storyline, we've got an awesome collection of classes... all live, all instructor-led, all online, and all incredibly interactive. ADOBE ROBOHELP 2019: The Fix is In! Adobe recently released RoboHelp 2019, a totally reimagined, rebuilt, re-everything RoboHelp. If you're a veteran RoboHelp user, I'm thinking you'll find the overhauled interface to be intuitive and significantly cleaner than previous versions of RoboHelp. In RoboHelp 2019, there are far fewer toolbars or tools. 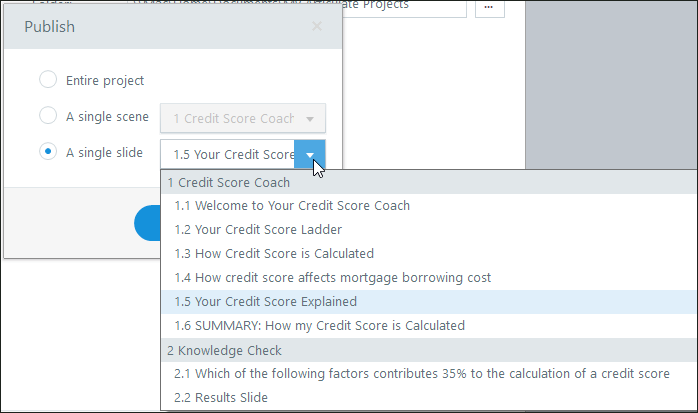 And while there are still some dialog boxes in RoboHelp 2019, much of the topic formatting work can be performed in panels to the left and right of the application window. 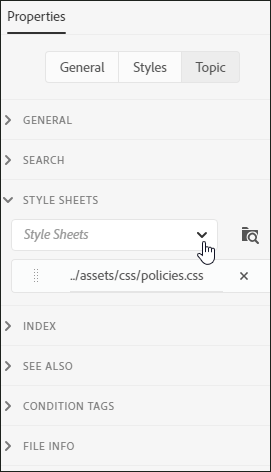 While Adobe has spent significant time streamlining RoboHelp's interface and development process, there are some awesome enhancements as well. One of my favorite features is Auto Fix Content. Although it is not necessary for you to know HTML to create RoboHelp projects, knowing a little HTML can pay off when imported content causes trouble because of misplaced or missing HTML tags. I imported an HTML file into a project. 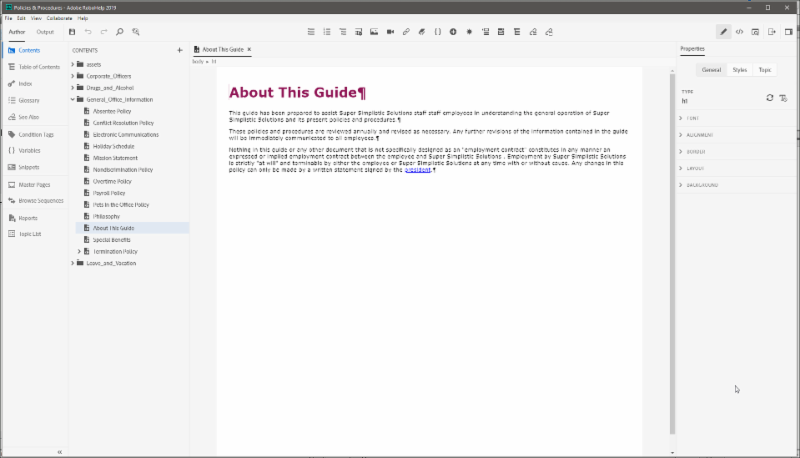 I then opened the topic expecting to see it in the Author window as shown in the first image above (where you see the text and the heading About This Guide). What I didn't know prior to importing the HTML file was that there were HTML code errors in the file. While the file imported without issue, upon attempting to edit the file, it automatically opened in HTML View. In the HTML View, I noticed that there was an error icon next to line 20 as shown below. I ran my mouse over the error icon and was alerted that the HTML file wasn't following conventional HTML rules (where tags must be paired). I'm comfortable with HTML and could have easily fixed the problem myself by adding the missing tag. However, if HTML isn't your thing, you'll love this awesome feature. From the top of the HTML View window, I clicked the Auto Fix Content icon. When publishing a Storyline project, it’s often preferable to publish a small section of the project instead of the entire thing (a single slide for instance or an individual scene). 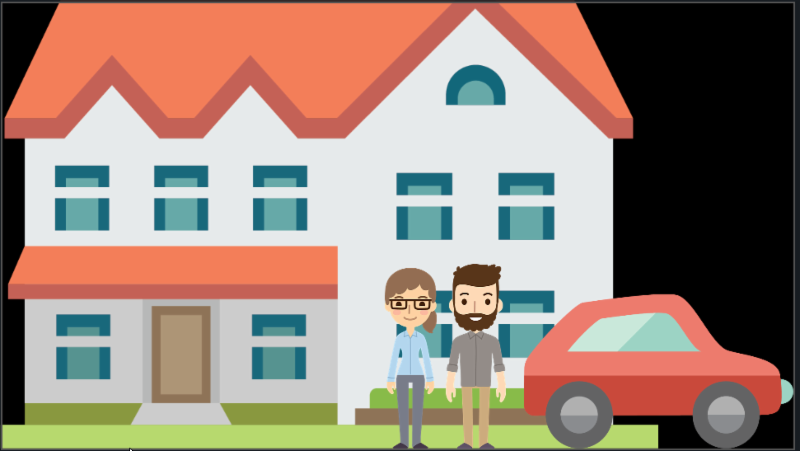 Fortunately, Storyline 360 makes quick work of this task, if you know where to look. Open Storyline’s Publish dialog box by either using the Publish tool on the Ribbon or choosing File > Publish. From the Properties area of the Publish dialog box, click the link to the right of Publish to open another Publish dialog box. From here you can elect to publish the entire project, a single scene, or from the A single slide drop-down menu, specify any slide from any scene within the project. Click the OK button and then click the Publish button to publish the selection. Need to learn Articulate Storyline? Want to save on travel? Consider our live, online, and 100% interactive and hands-on Storyline classes. Creating software simulations has always been one of Captivate's core strengths. From the Home screen, double-click Software Simulation, select the area of the screen or application to record, select your mode (or modes), click the Record button, and away you go. The recording process is seamless, except when it's not. These days I'm seeing a particularly frustrating error appear for more and more of my students. After double-clicking Software Simulation, instead of seeing a Recording Area and a control panel, users are seeing an error message about DPI Awareness. Specifically, the message says "Capture is disallowed since High-density displaying was detected. Please set 'DPIAwareness = 1' in AdobeCaptivate.ini and restart the application." Fortunately, the error only seems to affect people running a recent version of Windows 10 and only developers who are using a PC with a Retina display (such as a Microsoft Surface Pro). Unfortunately, there are more and more people with Retina displays who are reporting the error. 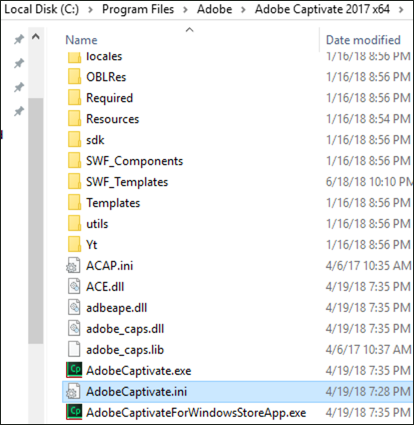 You can manually locate the AdobeCaptivate.ini file mentioned in the message by looking in the Adobe Captivate application folder. You can then edit the file in Notepad and change the DPI Awareness from 0 to 1 (and then restart Captivate). After changing the DPI Awareness and restarting Captivate, the Captivate software will be pretty small. However, you'll be able to move forward with recording the software simulation. While it's not difficult to edit the ini file, I'm betting if you're like most people, editing a support file in Notepad isn't something you're anxious to do. If so, I have a few alternatives for you. First, close Captivate. Then right-click your desktop and choose Display settings. 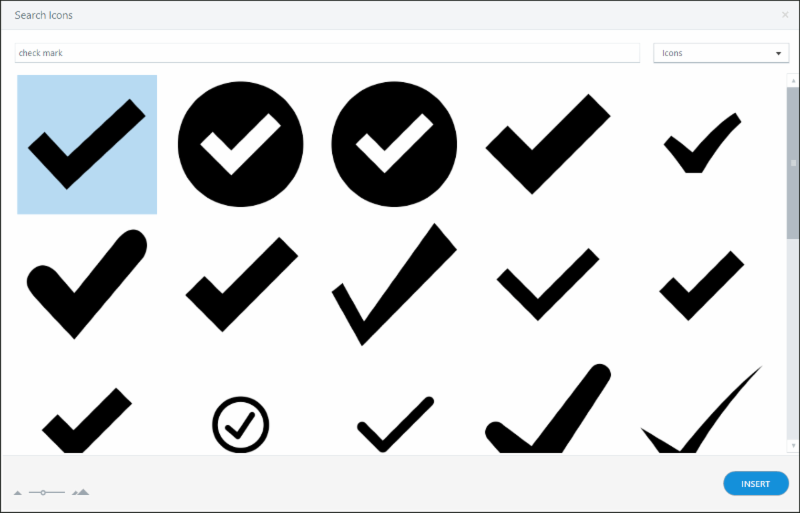 From the Scale and layout area, choose 100% from the Change the size of text, apps, and other items drop-down menu. Return to Captivate and try to create a software simulation. If the DPI Awareness issue is gone, great. If not, exit Captivate, right-click your desktop and choose Display settings again. From the Scale and layout area, click Advanced scaling settings. 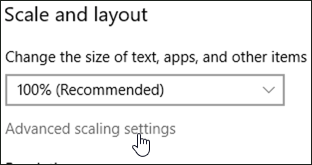 From the Fix scaling for apps area, turn off the option that allows Windows to try to fix apps so they're not blurry. Return to Captivate and try again to create a software simulation. If things still aren't working, don't panic... I've got one more trick up my sleeve. 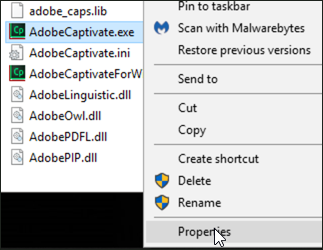 With Captivate once again closed, right-click the AdobeCaptivate.exe file (located in the Adobe Captivate application folder) and choose Properties. 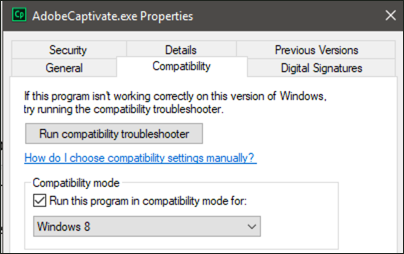 On the Compatibility tab, select Run this program in compatibility mode and choose Windows 8 from the drop-down menu. Click the OK button and restart Captivate. While the program itself may look tiny, you'll be able to move forward with your software simulation. Until a better solution is made available from either Adobe, Microsoft, or both, one or a combination of the steps above will likely work for you. If you have a better workaround, please share via a comment. If you're looking to learn Adobe Captivate, we've got an awesome collection of single-hour mini-courses, 3-hour sessions, multi-day classes... all live, all instructor-led, all online, and all incredibly interactive.